Avon. Used - Good. All orders guaranteed and ship within 24 hours. Your purchase supports More Than Words, a nonprofit job training program for youth, empowering youth to take charge of their lives by taking charge of a business. Avon. Mass Market Paperback. POOR. Noticeably used book. Heavy wear to cover. Pages contain marginal notes, underlining, and or highlighting. Possible ex library copy, with all the markings/stickers of that library. Accessories such as CD, codes, toys, and dust jackets may not be included. The Night Lives On : The Untold Stories and Secrets Behind the Sinking of the Unsinkable Ship - Titanic! HarperCollins Publishers, 1998. Mass Market Paperback. Acceptable. Disclaimer:A readable copy. All pages are intact, and the cover is intact. Pages can include considerable notes-in pen or highlighter-but the notes cannot obscure the text. At ThriftBooks, our motto is: Read More, Spend Less.Dust jacket quality is not guaranteed. HarperCollins Publishers, 1998. Mass Market Paperback. Good. Disclaimer:A copy that has been read, but remains in clean condition. All pages are intact, and the cover is intact. The spine may show signs of wear. Pages can include limited notes and highlighting, and the copy can include previous owner inscriptions. At ThriftBooks, our motto is: Read More, Spend Less.Dust jacket quality is not guaranteed. HarperCollins Publishers, 1998. Mass Market Paperback. Very Good. Disclaimer:A copy that has been read, but remains in excellent condition. Pages are intact and are not marred by notes or highlighting, but may contain a neat previous owner name. The spine remains undamaged. At ThriftBooks, our motto is: Read More, Spend Less.Dust jacket quality is not guaranteed. Avon. MASS MARKET PAPERBACK. 0380732033 Ships promptly from Texas. . Good. 1998. Avon. MASS MARKET PAPERBACK. 0380732033 Ships from Tennessee, usually the same or next day. . Fine. 1998. Avon, 1998-02-01. Mass Market Paperback. Very Good. Nice copy with light cover wear. Mild aging to clean pages with tight binding. Multiple copies may be available. 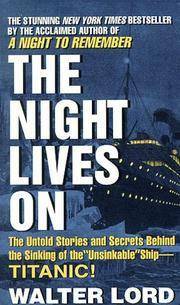 The Night Lives On : The Untold Stories and Secrets Behind the Sinking of the "Unsinkable" Ship - Titanic! New York, NY, U.S.A.: Avon Books, 1987. Second Printing. Mass Market Paperback. Very Good -. Brief summary of content available on request by e-mail. New York, NY, U.S.A.: Avon Books, 1987. First Printing. Mass Market Paperback. Good +. Brief summary of content available on request by e-mail. New York, NY, U.S.A.: Avon Books, 1987. Second Printing. Mass Market Paperback. Good +. Brief summary of content available on request by e-mail. AVON, 1986. Book. COLLECTIBLE - VERY GOOD. Paperback. First Edition THUS. The Night Lives on: The Untold Stories and Secrets Behind the Sinking of the 'Unsinkable' Ship - "Titanic"! Avon. Used - Good. Mass Market pb. Good, average condition for its age. Book has been read but remains straight, clean, and tight. No internal markings. Stored in sealed plastic protection. In the event of a problem we guarantee full refund. 1998. Mass Market pb. Avon Books. Used - Very Good. Ships from Reno, NV. Great condition for a used book! Minimal wear. 100% Money Back Guarantee. Shipped to over one million happy customers. Your purchase benefits world literacy! Avon Books. Used - Acceptable. Shows definite wear, and perhaps considerable marking on inside. Avon Books. Used - Good. Ships from Reno, NV. Shows some signs of wear, and may have some markings on the inside. 100% Money Back Guarantee. Shipped to over one million happy customers. Your purchase benefits world literacy! Avon Books. Used - Good. Shows some signs of wear, and may have some markings on the inside. Avon. MASS MARKET PAPERBACK. 0380732033 Item in good condition. Textbooks may not include supplemental items i.e. CDs, access codes etc... . Good. Avon. MASS MARKET PAPERBACK. 0380732033 Mild to moderate shelf/reading wear. Binding good. Orphans Treasure Box sells books to raise money for orphans and vulnerable kids. . Good.